Want to get more traffic to your blog? 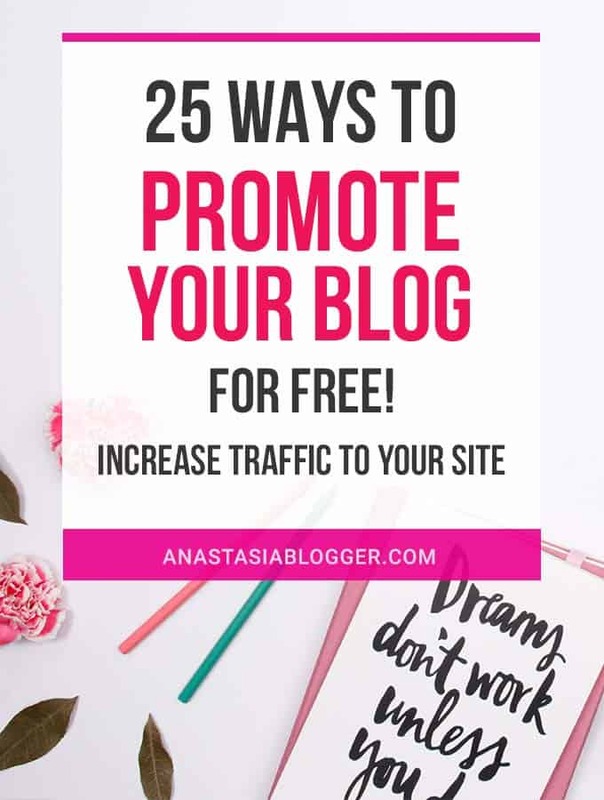 Here are 25 places to promote your blog for free that will help you drive a ton of traffic to your blog! All without spending a single cent on advertising. It can be frustrating to spend hours creating an amazing post, only to have no one read, comment, or share it once it’s published. The truth is, you’re going to have to put some time and effort into actively promoting your blog posts, especially as a new blogger, if you want to get people reading your blog! Dale from bloggingherway.com is sharing today her best tips for driving free traffic to a blog. From the common, tried and true methods, to some unique and uncommon channels, here are twenty-five places you can promote your blog for free! Facebook groups for bloggers are a great place to promote your blog and connect with other bloggers. Just make sure you are following the rules of the group! You can join groups specifically for bloggers, or more general groups related to your niche. Twitter is an awesome place to promote your latest blog posts. The Twitter feed moves fast, so you’ll see the best results from tweeting at least 2-3 links to blog posts per day. You can schedule tweets for free using a tool like Hootsuite. Not only is it a social media platform, Pinterest also functions as a visual search engine. This makes it incredibly useful for promoting your blog posts. Design graphics for each your blog posts using a graphic design program like PicMonkey in order to get the most clicks and re-pins on Pinterest. Group boards allow you to maximize exposure by getting your pins in front of thousands more people than just your own followers. Here are 120+ group boards for bloggers in every blogging niche. Join some group boards and pin your blog content to them every day. Instagram won’t let you post links to your blog in the caption of photos, but you CAN link to your blog in your bio. You can maximize your IG real estate by using the free app Linktree to include links to multiple blog posts in your bio. Talking about your new blog posts in Instagram Stories is a great way to drive traffic. If you have more than 10,000 followers, you can utilize the “swipe up” feature in Instagram Stories. If you aren’t to 10,000 followers yet, you can use Linktree like I mentioned above and direct your followers to check out the link in your bio. I know, I know, nobody uses Google+. So why would you bother to promote your blog there?! It turns out, sharing your blog posts on Google+ is a great way to improve your SEO and boost your blog’s ranking in Google search results. Guest posting is an amazing way to promote your blog and drive traffic to it, because you’ll get a link back to your own blog in the post. Reach out to some more popular bloggers in your niche and see if they are interested in having you as a guest blogger. More often than not, they will say yes! Can you really promote your blog by commenting on other blogs? Yep! Leave thoughtful comments on posts from other bloggers in your niche, and include a link to your own blog at the end. I get traffic from comments I have written every single month! Reddit is an active online forum with thousands of “sub-reddits” dedicated to different topics. Find a few sub-reddits relevant to your blog topic, and respond to comments with a link to your blog when relevant. Make sure to follow the rules of the sub-reddit! Quora is a very popular question-and-answer site. You can answer questions within your niche and link to your blog or a relevant blog post. Popular questions on Quora get hundreds of thousands of views, which can translate into major traffic back to your blog. Research from Hubspot shows that blogs that post more frequently (16+ times per month) get 3.5 times more traffic than blogs that post only 0-5 times per month. Posting more frequently is a simple way to get more traffic to your blog. Include links to other bloggers in your blog posts, and let them know that you have featured them! This will usually result in them sharing the post (everyone likes to be featured!) and is a great way to build connections with other bloggers. Do you already have an email list for your blog? If not, start one today! You can send a weekly email newsletter to your subscribers containing links to your recent blog posts, as well as extra value (like exclusive tips or mini blog posts) to keep them interested. Bloglovin’ is a great place for promoting your blog and discovering new bloggers! It shows your blog posts in a feed for your followers. Admittedly I haven’t done much with Bloglovin’, but I surprisingly get a little bit of traffic from it each month anyway. You can make a video version of all of your blog posts. Creating YouTube videos for your blog is an amazing way to reach a larger audience and drive traffic to your blog. If someone is already reading your blog, keep them there! One of the best ways to retain visitors and get them clicking around on your blog is by including internal links in your posts. I have already done it three times so far in this post by including relevant links to some of my other blog posts when helpful. I also use a plug-in called Inline Related Posts to automatically share links to other blog posts within my content! I mentioned promoting your blog in Facebook groups at the top of this list, but starting your own Facebook group is another great way to promote your blog and get traffic. In your group board you decide how much of your own posts will be shared to members and in which form, and it also helps you build your authority in the niche. LinkedIn isn’t just for finding jobs and networking! It’s also a great platform for sharing your blog posts, especially ones that are more professional in tone. Don’t neglect basic SEO (search engine optimization.) Getting search engine traffic is one of the easiest, most passive ways to promote your blog. Get the free plug-in Yoast SEO to help you write blog posts that are search-engine friendly. This is similar to mentioning other bloggers, except you’re creating a whole round-up post featuring other bloggers. Reach out to popular bloggers in your niche and ask if they would contribute a short paragraph to your post (Ex. “10 Professional Travel Bloggers Share Their Top Travel Tips”) and then let them know once the post is live so they can share it! Triberr is a platform that lets you join “tribes” of bloggers and promote each other’s content. This is a great free way to promote your blog, while helping out other bloggers in return! I mentioned guest posting earlier, but another great way to promote your blog is to have other guest post for you. Let your guest bloggers know when their post goes live, and ask them to share it with their audience! This can drive a lot of traffic back to your blog and allow you to reach new readers. Joining blog directories is a great free way to promote your blog. It’s also a good way to build links to your blog, which improves your SEO and helps you establish authority with Google. Here are 131 blog directories that are free to join. Flipboard is an aggregate content platform that shows news stories and blog posts in a magazine style. Putting your blog posts on Flipboard can be a good way to expand your audience. There you go! Twenty-five places to promote your blog for free! Remember that successful blogging follows the 80/20 rule – 20% content creation, and 80% promotion. Once you figure out which promotional channels work best for you, you can streamline and focus on just a few of the highest traffic driving platforms. For me, that means SEO and Pinterest. But it really depends on your particular blog, niche, and audience! Experiment with these different promotional strategies to find out what works best for you. Do you want to get back to this post and implement the tips later? Save THIS PIN to your Blogging board on Pinteres. I ‘ve just started to make use of quora. Although I don’t see much traffic from it presently, I believe that will definitely improve with more helpful answers on it. Quora is a great way to help others. Best of luck. Our favorite is #12 to publish more frequently. Thanks again for all your time and research on this post! Great, thank you for sharing! I’m in your group board, sharing some of you pins too! Great, thank you for sharing! I’m in your group board, sharing some of your pins too! When your blog post title caught my eye, I thought I would be reinforcing on information I already knew. I now admit that I’ve learnt new things thanks to you! One important piece of info was how Google Plus helped with SEO. I didn’t know that, although I was sharing posts on Google Plus every now and then. Now, I know I need to do that every chance I get! One thing that caught my attention was Flipboard – I’ve been using this app on my iPad and it’s a gem. But I’ve never considered it as a way to promote my blog. How would you use it to do so?